Twas the season and Christmas was fast approaching. I volunteered to cook for our large family Christmas gathering and an underground oven was calling my name. What I envisioned was a casual menu of freshly made tortillas holding chunks of slowly cooked fork tender pork topped with killer homemade salsas. 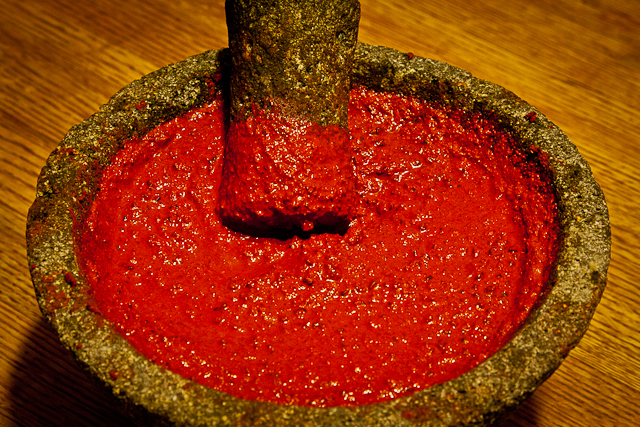 I started two days before Christmas by making an Achiote Rub with the aid of a molcajete. To the rub I added orange and lime juice to make a marinade that was injected all around a 55-pound pig. The pig was then packed in ice and allowed to marinate overnight. 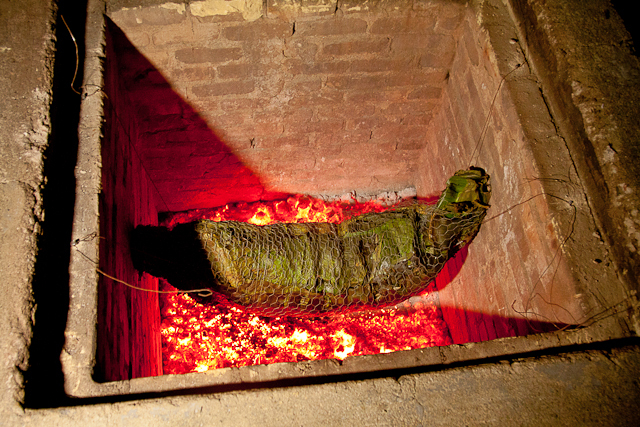 On Christmas Eve logs upon logs were packed into a 5 foot deep by 5-foot wide underground brick oven and ignited to create an inferno. While the fire was roaring we laid down a large piece of chicken wire on top of a table. 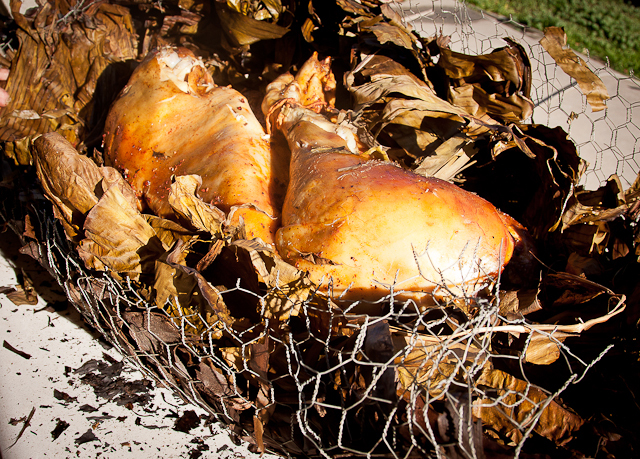 We then layered on top of the wire banana leaves to serve as a bed for our marinated pig. Once the walls of the oven glowed red hot and nothing but burning embers were left the oven was ready to cook. 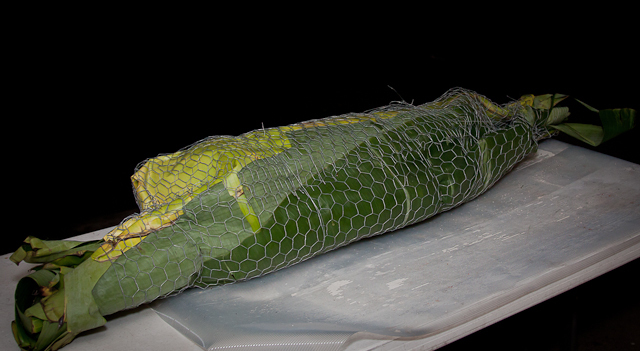 A wire was fed through each side of the Tamalazo and it was carefully carried to the oven. The oven was incredibly hot and with a great deal of patience each end of the wire was fed through 4 wired loops that was secured to the top rim of the oven. The tamalazo now hung suspended in the oven. We quickly covered the oven with two iron doors and then with two large sheets of plywood. With the loss of oxygen in the oven white smoke started to billow through the cracks signaling that fire had been snuffed out and the cooking had begun. The pig cooked overnight for 20 hours. 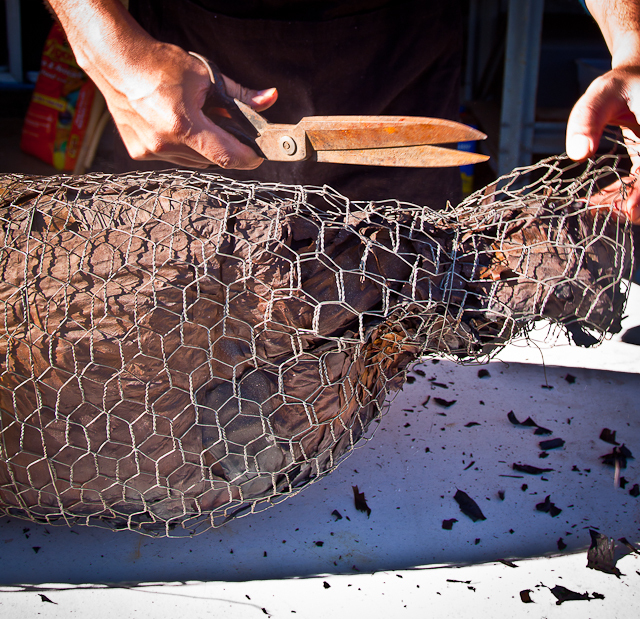 On Christmas Day we raised the pig from the oven and cut open the chicken wire and banana leaves to find the pig fully cooked, hot and fork tender. We carefully removed pieces of pork and placed them into roasting pans to be quickly transported to our Christmas Day table. As family members began to make homemade tortillas an assembly line of ingredients quickly formed on the main table with the Cochinito Pibil first in line followed by all the fixings to make some great tacos. Every year my family and I take a trip to a campground just north of Santa Barbara called El Capitan Canyon. It’s a great place to cook over an open fire. 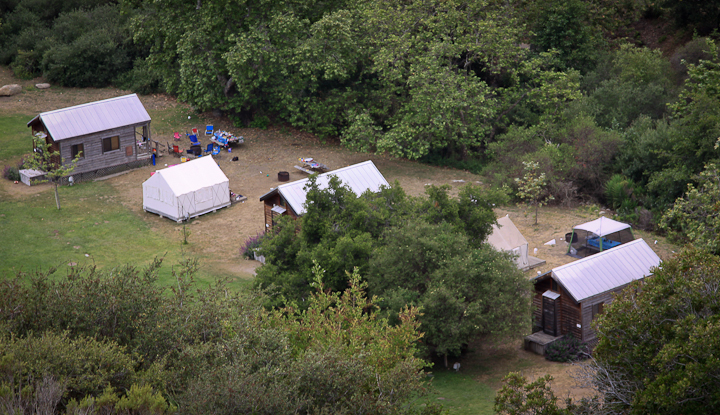 El Capitan Canyon is best known for their glamping amenities. And by glamping I mean glamorous camping. You can either stay in a cabin that has a full size bed, bathroom, and small kitchenette. If you’re feeling a bit adventurous you can stay in one of their tents. Instead of sleeping in a sleeping bag on the ground the tent comes with a full size bed that’s complete with fluffy comforters and pillows. Every campsite comes with a fire ring and a grate for your basic cooking. This is what really draws me to this spot year after year. Not only do I get to spend quality outdoor time with my family but I also get to cook over an open fire using the grate and my cast iron cookware. 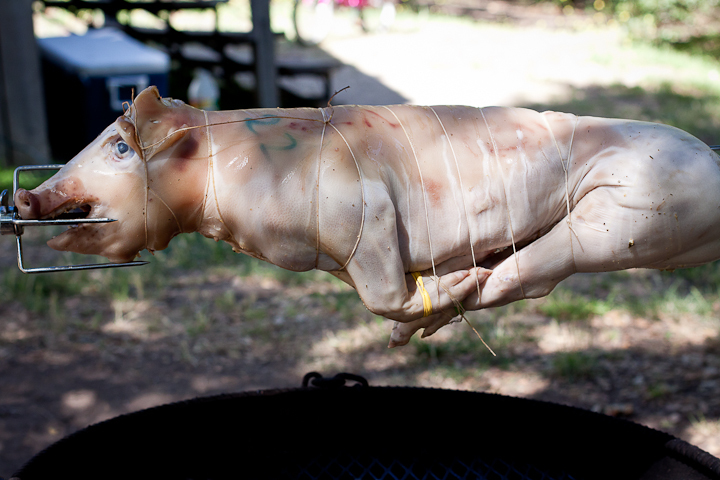 Year after year I like to try out new over the fire recipes and after attending Cochon 555 a competition between 5 chefs who cook a whole pig in Los Angeles my obvious choice for this camping trip was pig; roasted pig. I’ve always dreamed of roasting a whole pig on a rotisserie over an open fire and now I had the opportunity. The first order of business was to find a rotisserie that I could easily setup over the fire ring. After researching online I came across the portable rotisserie from www.onegrill.com . 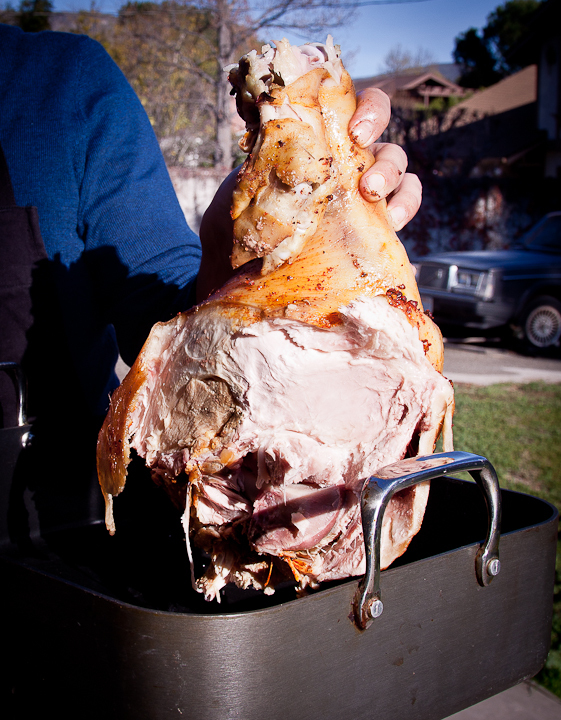 The design of the rotisserie was very simple. 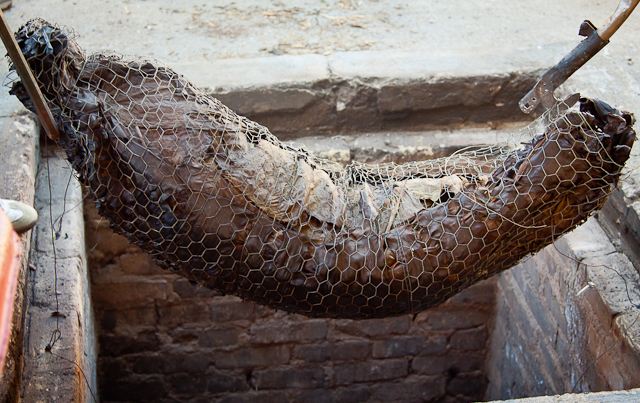 It came with a motorized forty-five inch spit that can handle up to forty pounds of meat and is supported by two steel rods that are easily hammered into the ground. 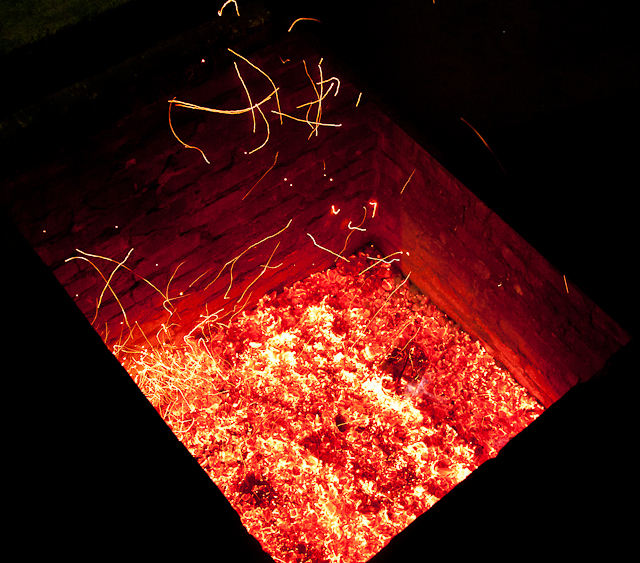 The brackets that support the spit can adjust up and down the length of the rods to allow for the meat to be cooked closer or further from the actual fire. 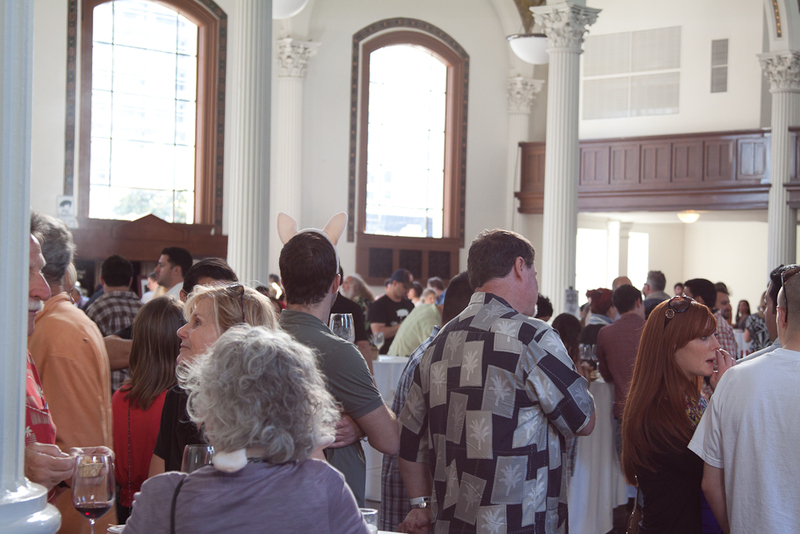 At Cochon 555 I was introduced to one of the event sponsors, Lindy and Grundy. They offer a full service sustainable butcher shop in the Los Angeles area that provides meat that’s locally raised and harvested using organic and humane methods. 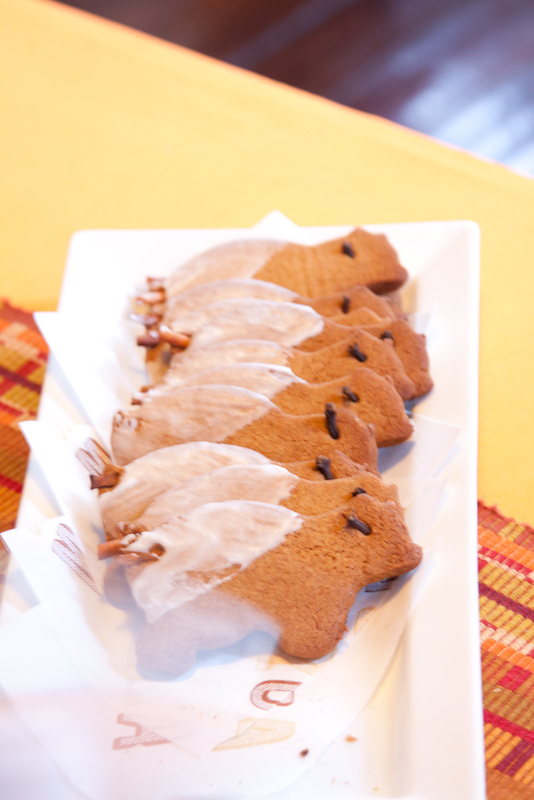 They provide the highest quality cuts of meat and was a great source to provide a pig for the roast. Considering the size of the fire ring, length of the spit and the number of family members on the trip, Lindy and Grundy suggested that I roast a suckling pig which is a milk fed piglet between the age of two and six weeks. 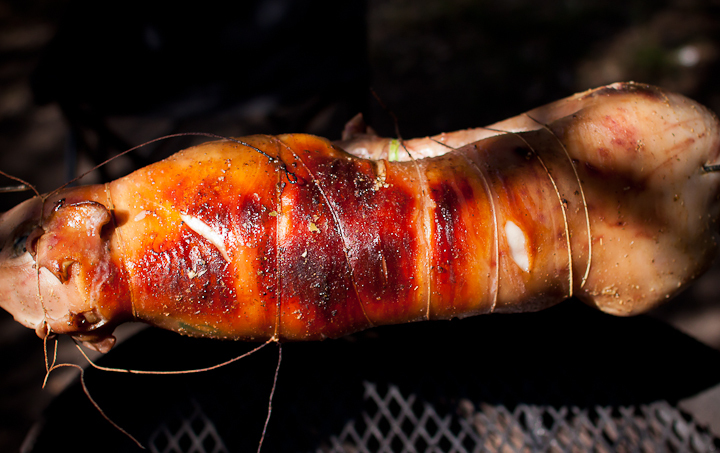 This immediately made me think of Lechon Asado, which is a suckling pig that is seasoned with the classic Cuban garlic sauce Mojo Criiollo. My excitement started to grow as the recipe started to develop in my head. Lindy and Grundy were able to get me a freshly harvested suckling pig two days before the night of the roast. It weighed 22 pounds and was 32 inches long. Once I got the pig home I placed it inside of a very large sealable plastic bag and poured in a brine mixture. A brine is a mixture of equal parts salt and sugar dissolved in plenty of water. 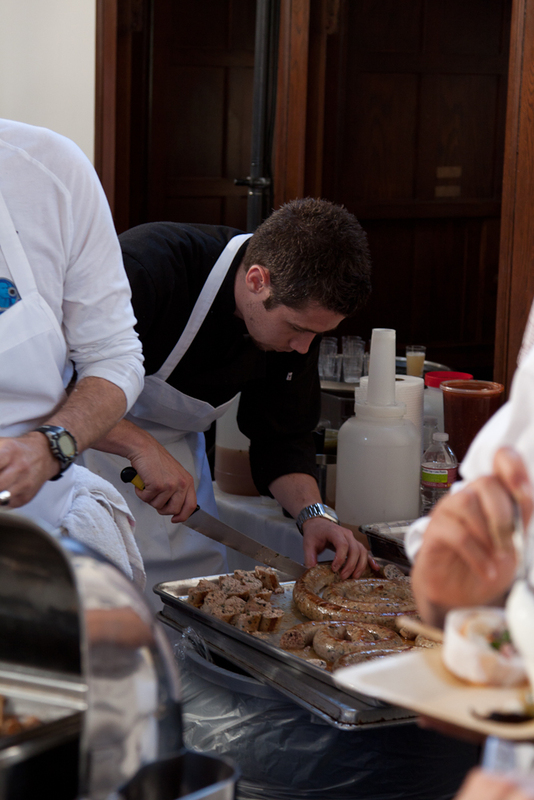 The mixture helps enhance the true flavor and texture of the pork before cooking. I then tightly sealed the bag and placed it in the refrigerator overnight. The next morning the bag was placed inside an ice chest in the back of my car with plenty of ice for transport to the campground. The morning of the roast I removed the pig from the brine and used a syringe to inject the mojo criollo all over the inside of the body. 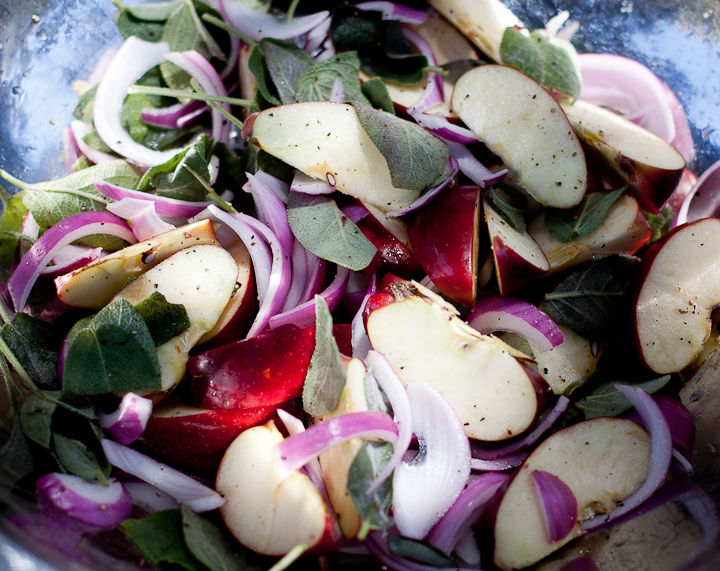 For some extra flavor I decided to make a stuffing of apples, red onions, sage, apple cider vinegar, salt and black pepper. I placed the stuffing inside the cavity of the pig and used a larding needle and butchers twine to stitch the cavity shut. 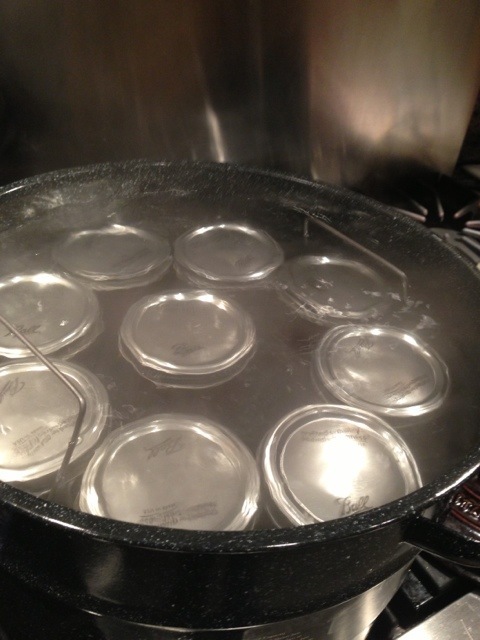 The funny part was I couldn’t find a single larding needle after visiting three high-end cooking/restaurant stores. The closest thing to a needle that I could find was a metal skewer with a large round eyelet on one end. 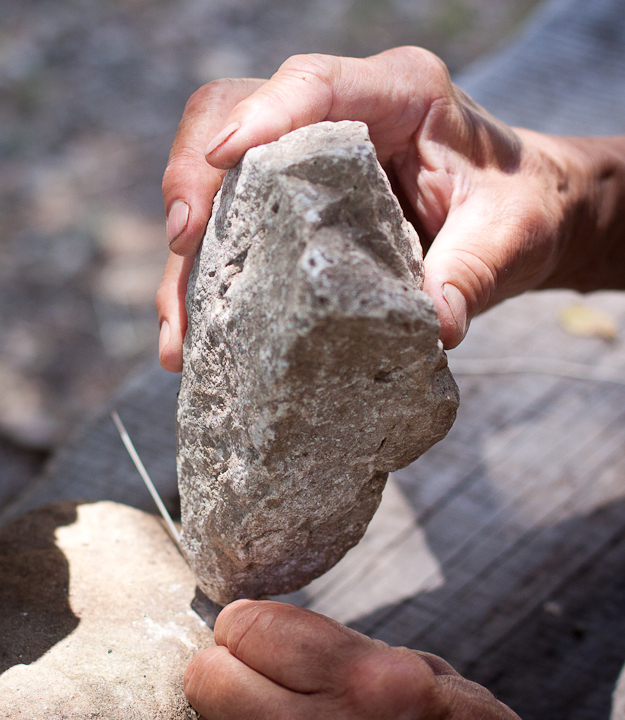 When I was ready to stitch up the pig I had to use a rock to bash the round eyelet shut so that it would not snag with each pass through the pigskin. With the pig prepped it was now time to insert the spit through the pig. 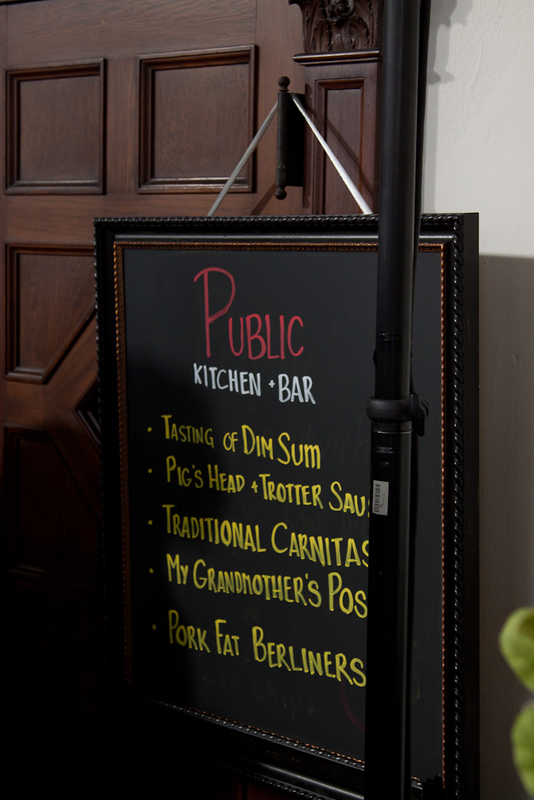 The spit comes with two adjustable forks that go on each side of the pig lengthwise to firmly secure it in place. 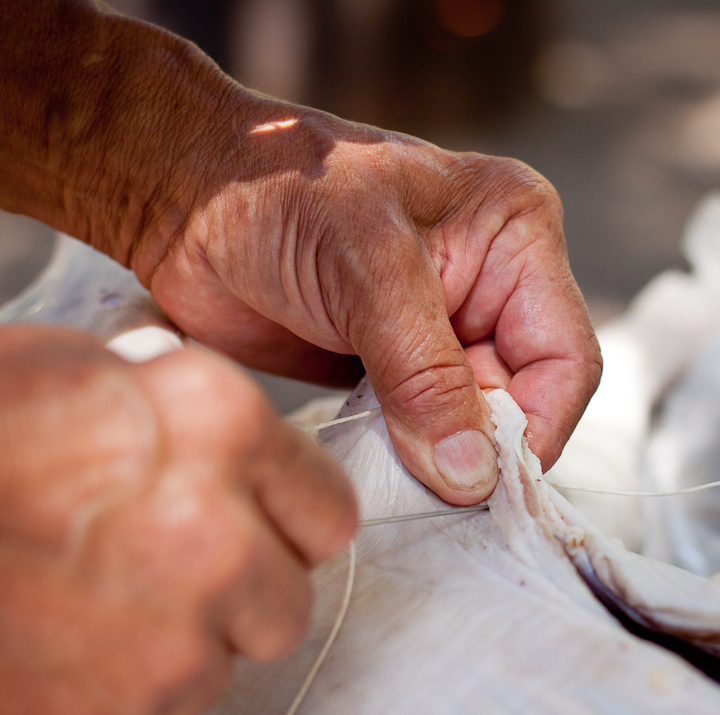 To further secure the pig in place butcher twine is used to tie the legs closely to the body. 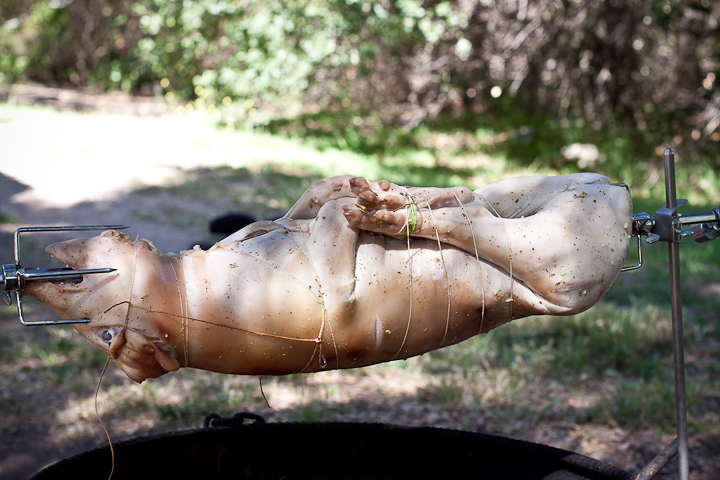 The main objective is to tie the pig as tightly together as possible so it rotates smoothly and cooks evenly. Now it was time to start the fire. 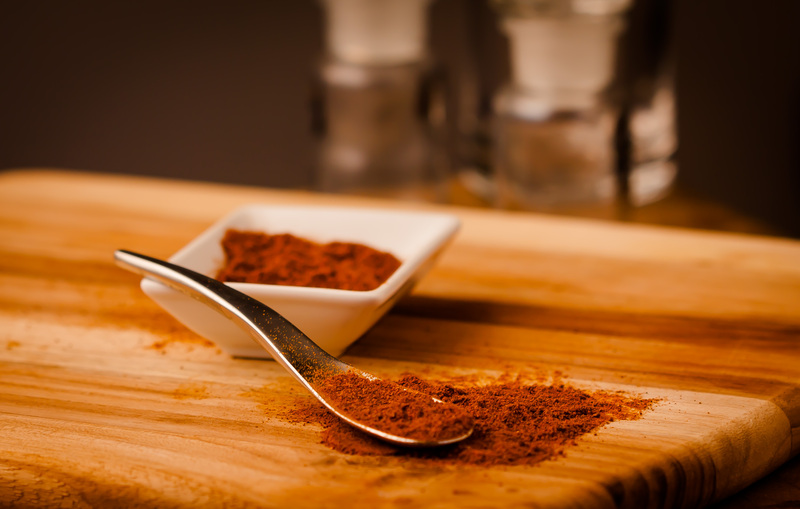 The benefit of cooking in the central part of California is the availability of red oak. This is great wood to cook over since it produces a mellow and flavorful smoke. After I had glowing embers I placed the pig over the fire and started the rotisserieengine. The pig started to rotate slowly. As it reached it’s first half turn with the four legs now on top the weight of the pig shifted, resulting in a faster second half turn. 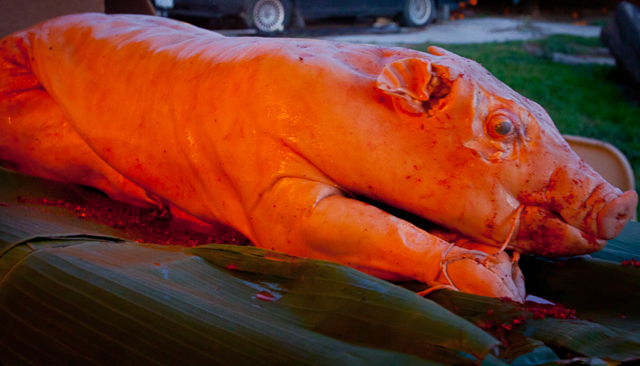 I quickly realized that one side of the pig would cook faster since one side was taking longer to turn over the fire. The spit comes with a counter weight to help with the lopsided weight of the pork. It helps a little but not enough so I had to stop the motor from time to time to allow the other side of the pig to catch up and cook evenly. Logs of red oak were added as needed to keep the fire going. 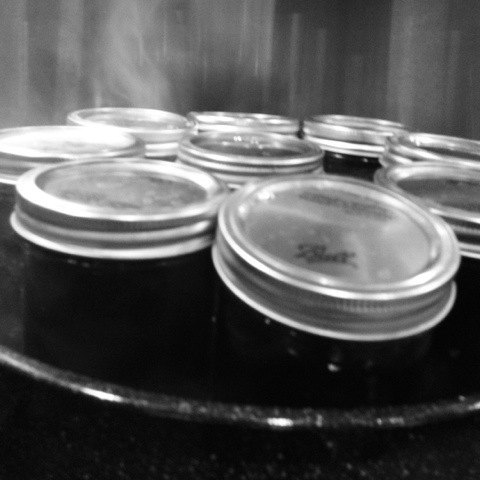 I found myself constantly tending to the fire by moving embers around to even out the heat across the body of the pig. My anticipation of a great meal grew with every turn as I watched the suckling pigs skin color turn from pale pink to rich amber. With the pork in full swing slowly roasting over the hot embers a communal feeling took over the campsite and everyone gathered to watch the rotating pig. As the day became night the news and aroma of the roasting suckling pig made the rounds around El Capitan. We began to notice increased foot traffic around our campsite. 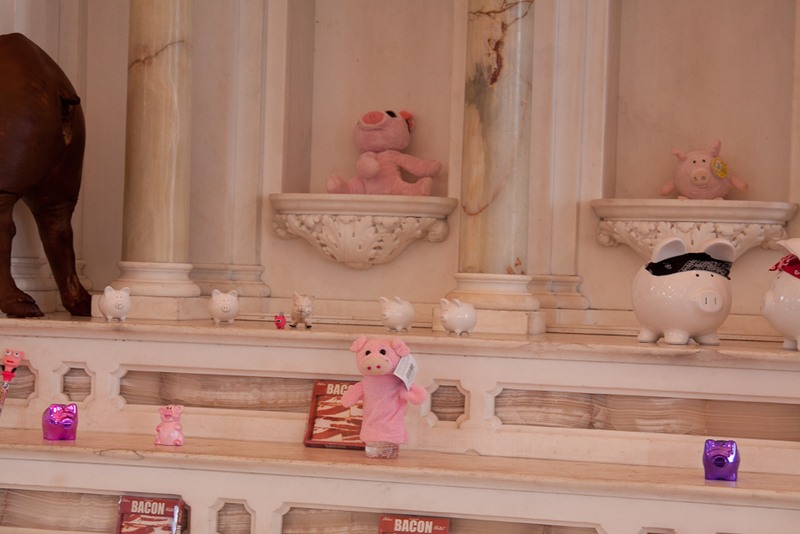 I don’t think many of these campers expected to see a pig roast. For the last hour I basted the suckling pig with Cola to help crisp and sweeten the roasted skin. 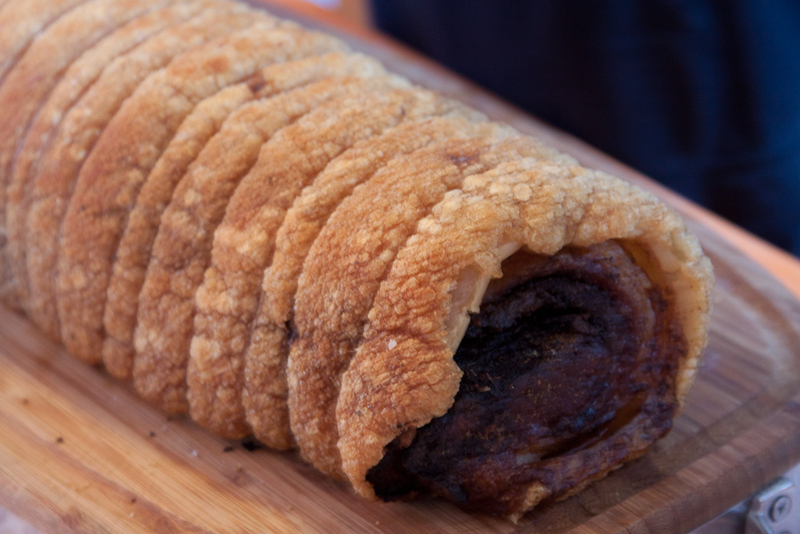 The end result is what is called Crackling. 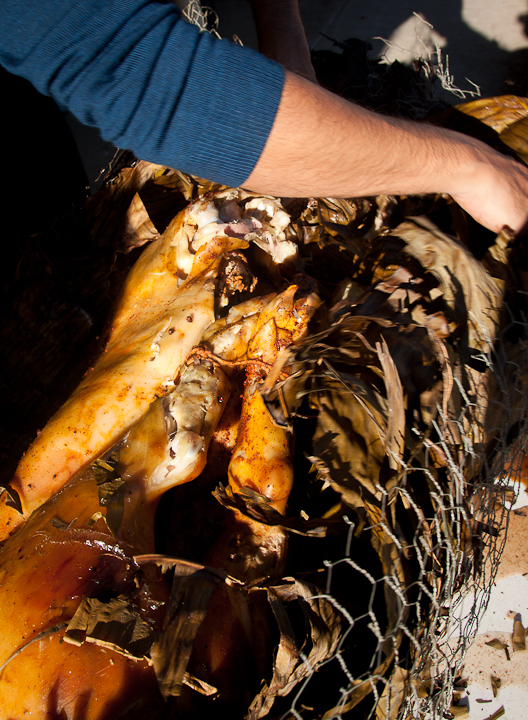 The skin hardens and starts to crack resulting in salty bacon like crunchy chips. 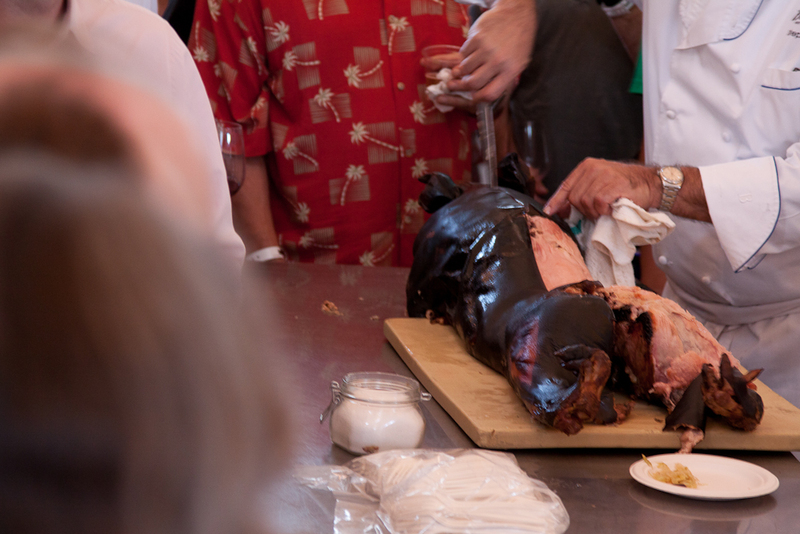 The roasted pig was removed from the spit and allowed to rest. The feast started with appetizers of freshly sliced crackling, light and tender pig cheeks, and the slightly chewy but incredibly flavorful pig ears. 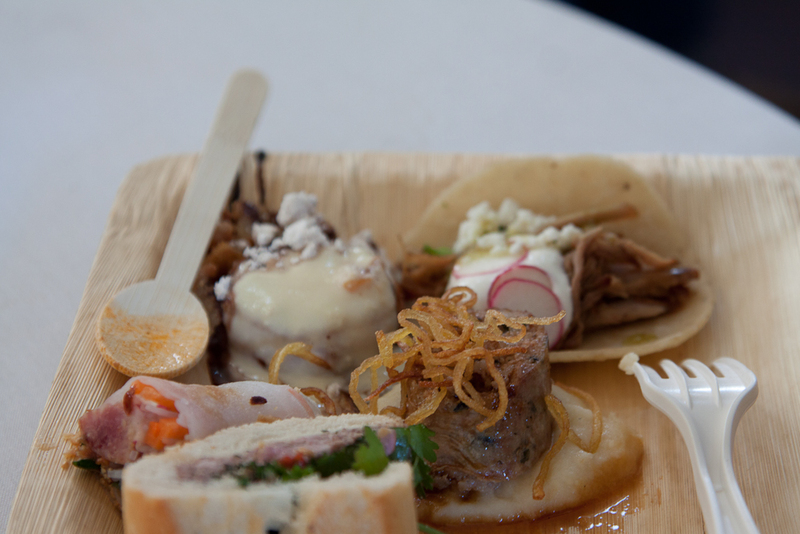 It then quickly moved to the main course of pulled pork and baby back ribs, dipped in mojo criollo. All of the meat was fork tender with hints of sweetness from the mojo criollo and the gentle smoky kiss from the red oak. The most important flavor that did not get lost was that of pork. This was a delicious suckling pig that was enjoyed by all under the California stars. 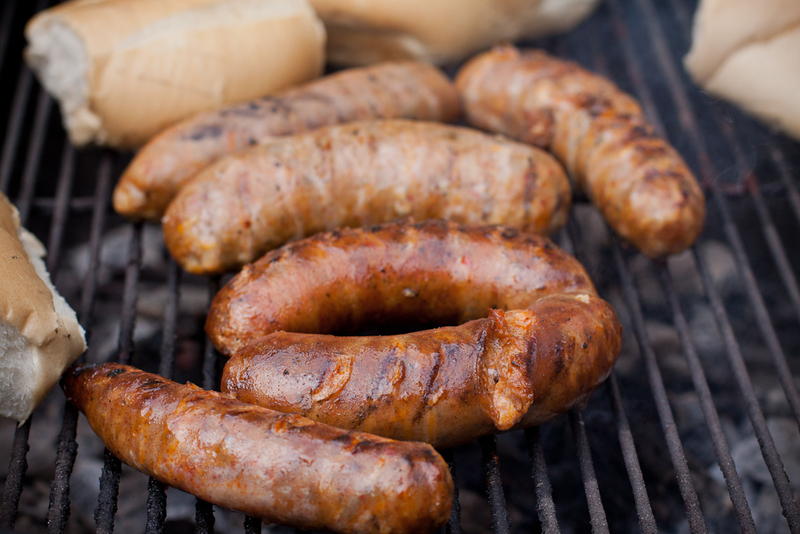 The Lindy and Grundy Sausages in the refrigerator have been beckoning me all week. So with a little free time today I decided to grill up the Spicy Pork with Kimchee Sausage and the Mexican Chorizo. I sparked up the mesquite and grilled them with some Cuban bolillos from Porto’s in Glendale, Ca. No quite a Choripan but still a delicious combination. To go on the side I made a Tomato and Red Onion Salad. After grilling them up I sliced the sausage in half length wise and placed it inside of the bolillo. Then I placed some salad on top making sure to spoon in some extra vinaigrette. This was a killer sandwich with every bite. First the crunch of the bread. Then the taste of the vinaigrette soaked into the bread. Then the spicy warm deliciousness of the sausage to be followed with the cool taste of tomatoes. What a great way to start the long weekend. It was a Friday afternoon and while browsing my Twitter feed I came across a post from Lindy and Grundy. 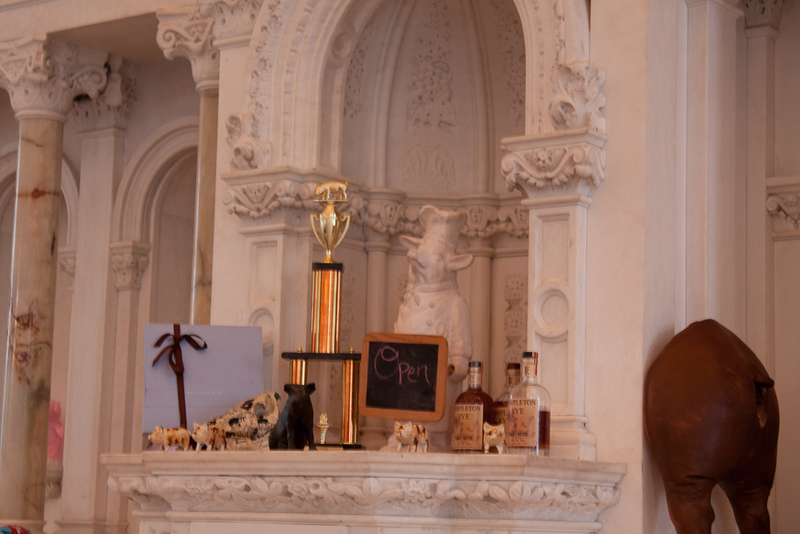 They’re a new butcher shop in Los Angeles that sells local, pastured and organic meat. 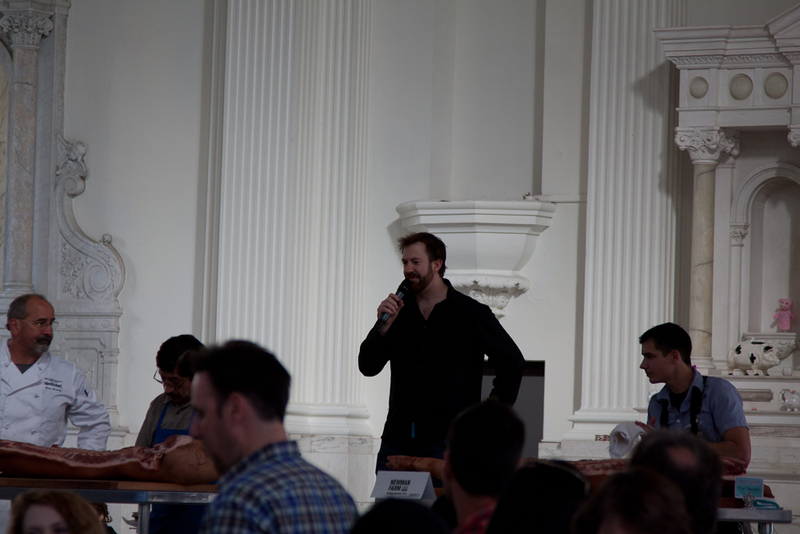 I first became acquainted with them when I saw their name on the Cochon 555 website and then later running around the event helping out with the butcher competition and serving as judges for the competition. 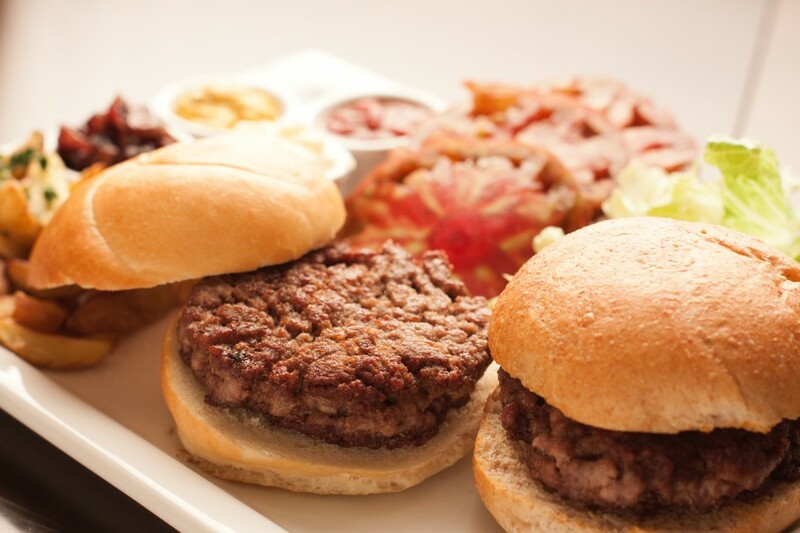 Beef ‘n bacon grind makes the BEST burger you’ll ever have!! Top it off with Farmstead original blue cheese, caramelized onions & arugala! That really peaked my curiosity and since I was in the neighborhood I decided to stop by and check out their shop. What a great shop. Super clean and bright with an impeccable selection of meats. So much different from you what you’d expect from your local plastic wrapped supermarket meat cases. The meat is fresh, vibrant and just beautiful. 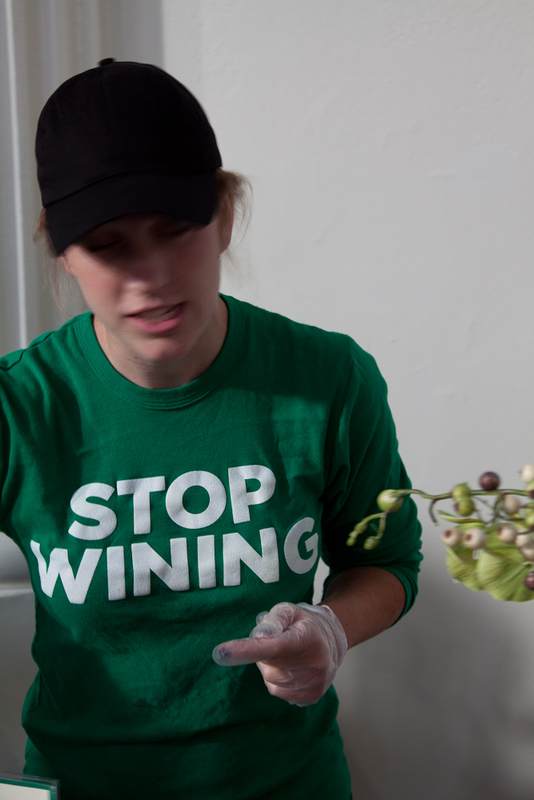 I met Amelia Posada aka Shop Mama (total sweetheart) who described to me the Beef’n Bacon Grind. 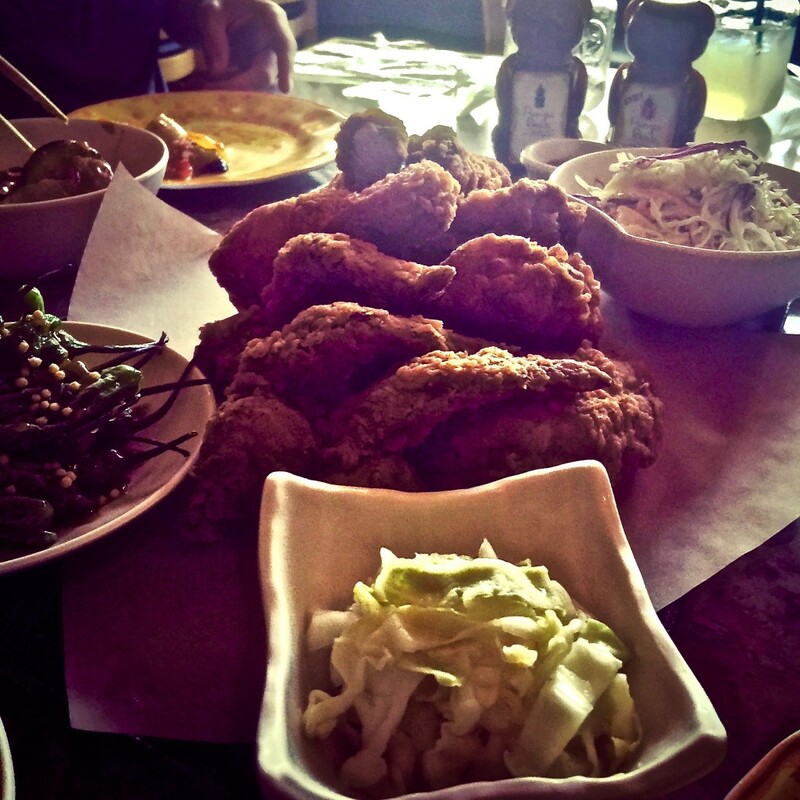 It is comprised of 50% pork belly and is ground fresh daily. The grind was impressive so I took home a pound to make some extra special burgers for my family. 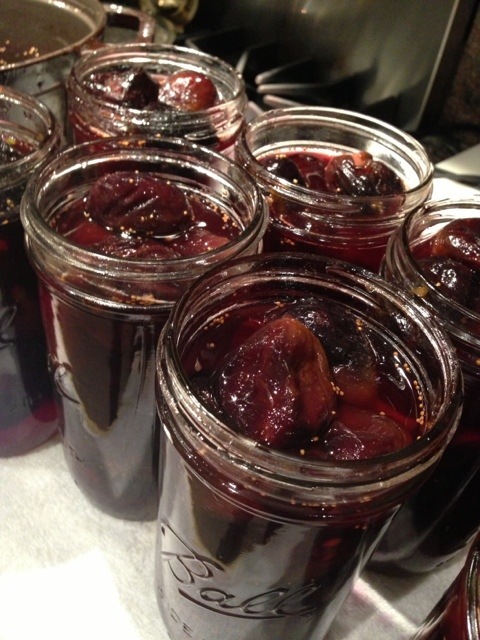 I bought some great Kaiser rolls, heirloom tomatoes, and made a balsamic onion relish. I formed two 1/2-pound patties with no seasoning, it doesn’t need it. Preheated the oven to 375 degrees and warmed up a cast iron skillet over high heat. I coated the skillet with two tablespoons of vegetable oil and seared each side of the burgers for 2 minutes. I then placed the skillet in the oven for 10 minutes to finish cooking. The burgers were excellent. Juicy and tender with a great smokey bacon flavor. I can’t wait till June when they’ll be finish dry aging 6 steers. 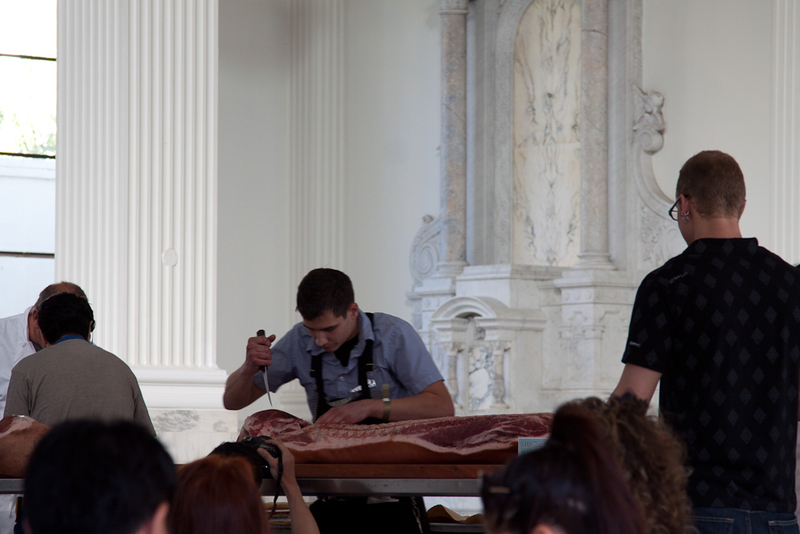 Their meat cases will be bursting with some incredible cuts of beef. The event founded by Brady Lowe is on a mission. 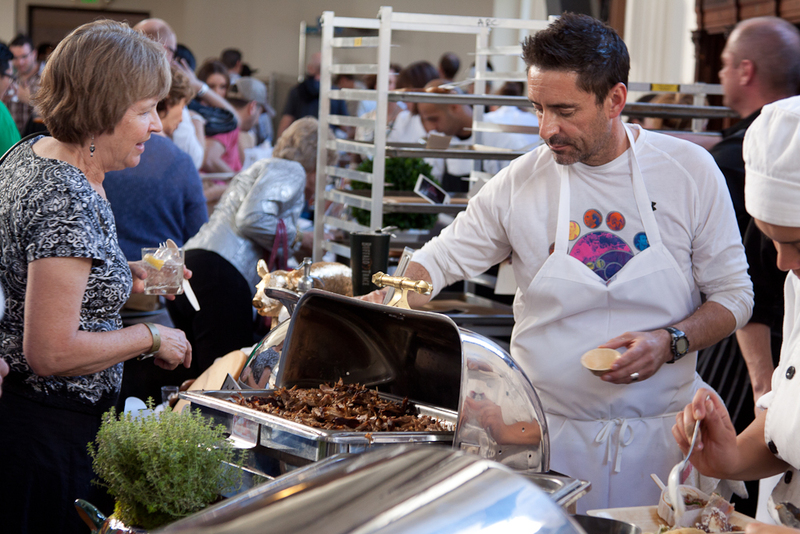 Their Mission: Cochon 555 is a one-of-a-kind traveling culinary competition and tasting event–five chefs, five pigs, five wine makers–to promote sustainable farming of heritage breed pigs. 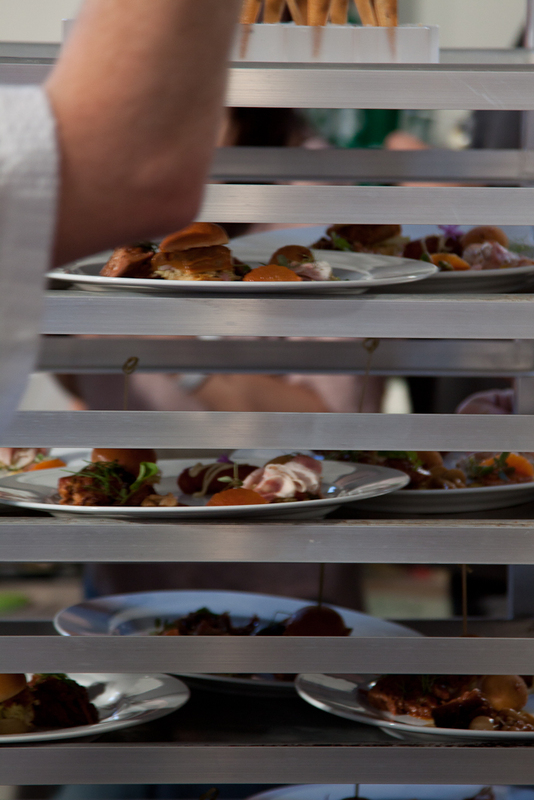 Each stop along the ten-city tour offers hard-working local farmers the opportunity to connect with like-minded agriculturalists, renowned chefs and the pork-loving public. Our goal is to help family farms sustain and expand their businesses and to encourage breed diversity. 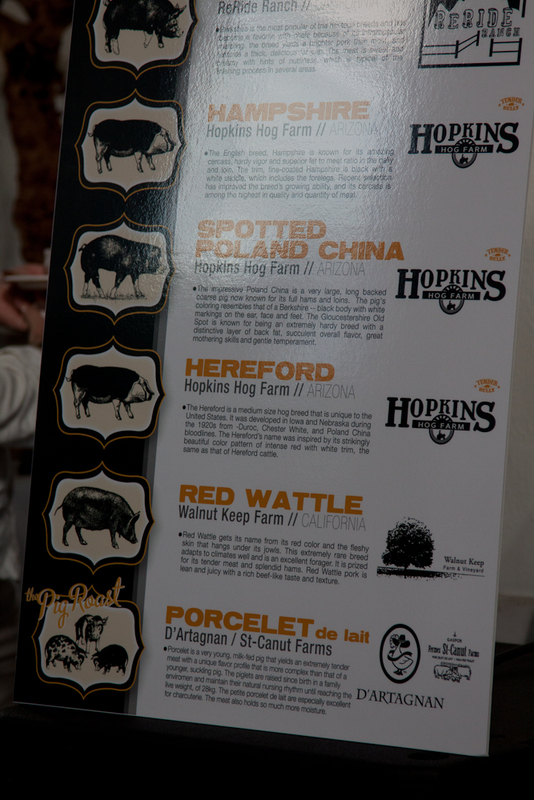 Cochon 555 is the only heritage breed pig culinary competition in the country. 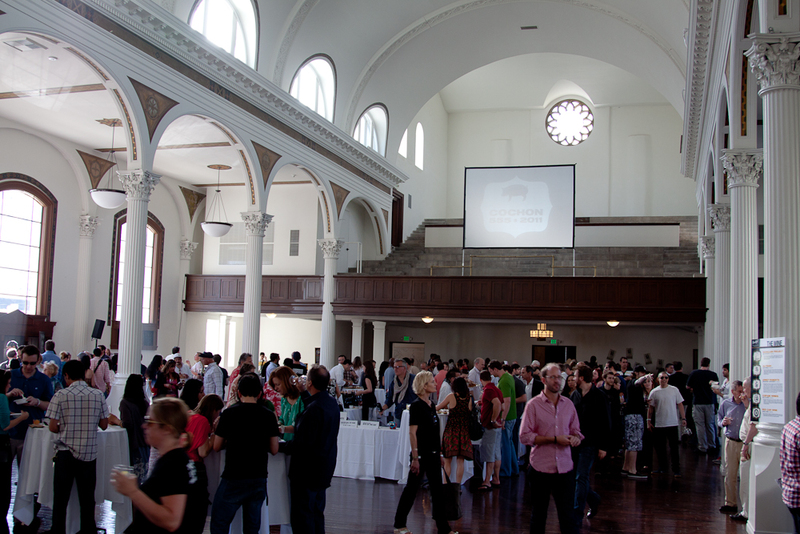 The event was held last night in Downtown Los Angeles at Vibiana’s which used to be the Cathedral of Los Angeles. 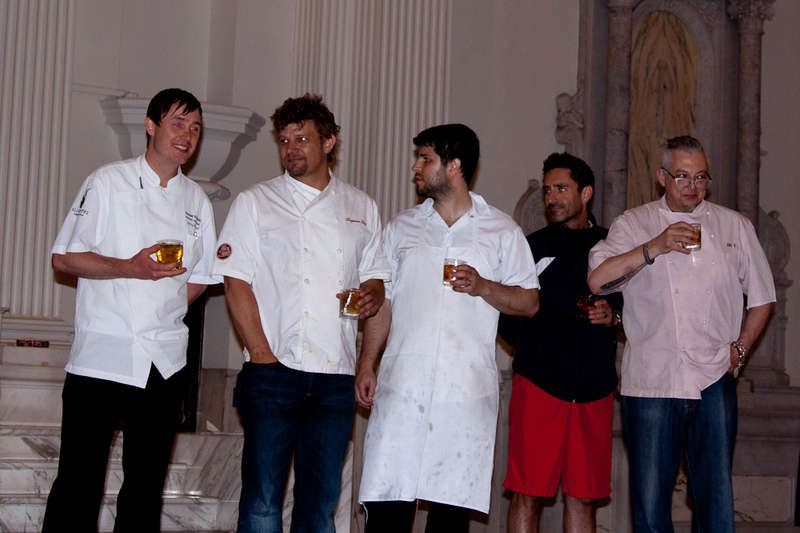 This is an old church that has been stripped of all of its religious symbols and served as an appropriate setting for Swinetologists to gather and celebrate the creations of 5 of the best chefs in the city. This is an amazing event. 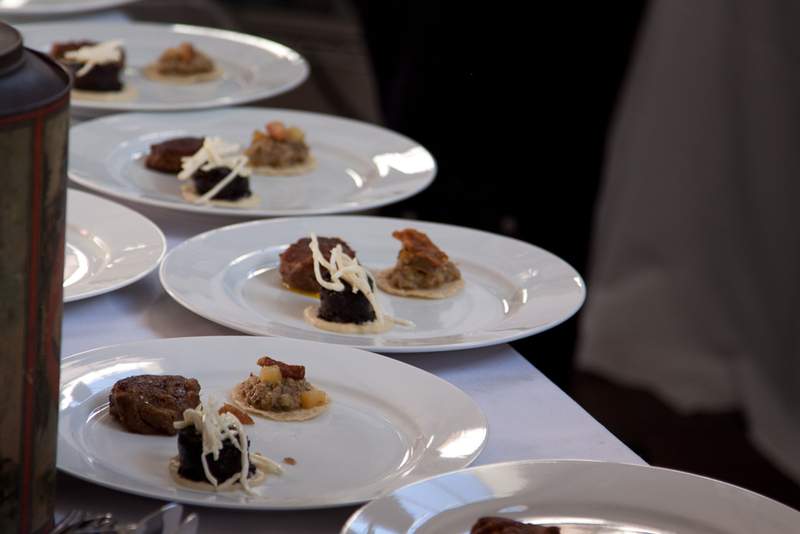 Each chef gets a 175 pound heritage breed pig and they have to prepare it from head to toe with dishes to wow the judges and guests. 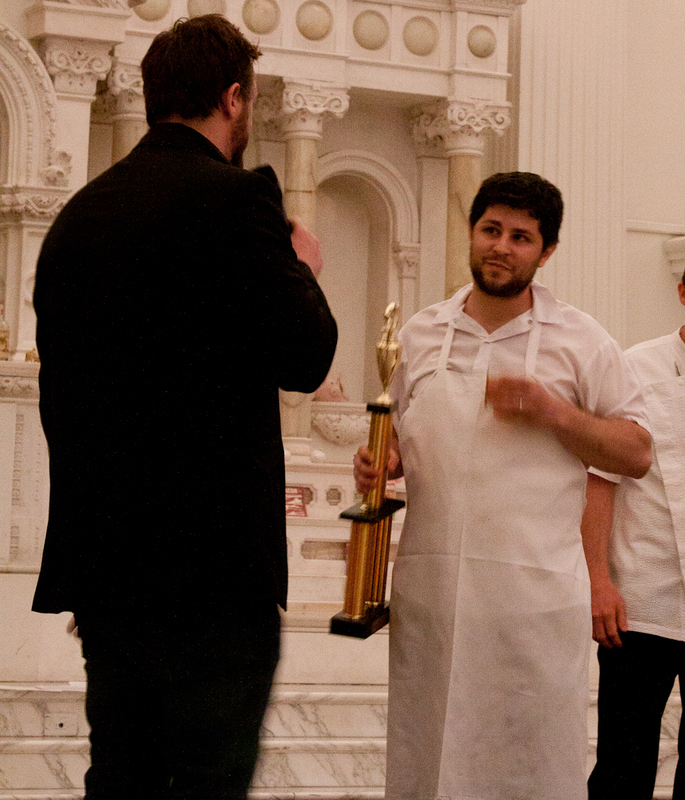 The winning chef receives an invitation to the finals held at the Aspen Food and Wine Festival. The food just didn’t stop coming. Trying to keep up with the numerous choices was overwhelming. And just when you think it’s over they roll out two milk fed pigs that have been smoked for 12 hours for what they call the family meal. 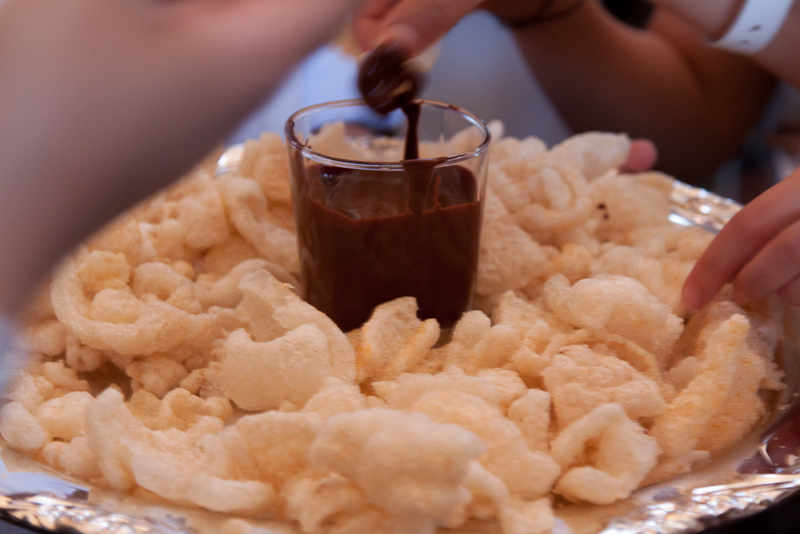 Shortly thereafter they bring out trays a light and crispy fried pork skin with a dark chocolate sauce for dipping. Pure decadence. 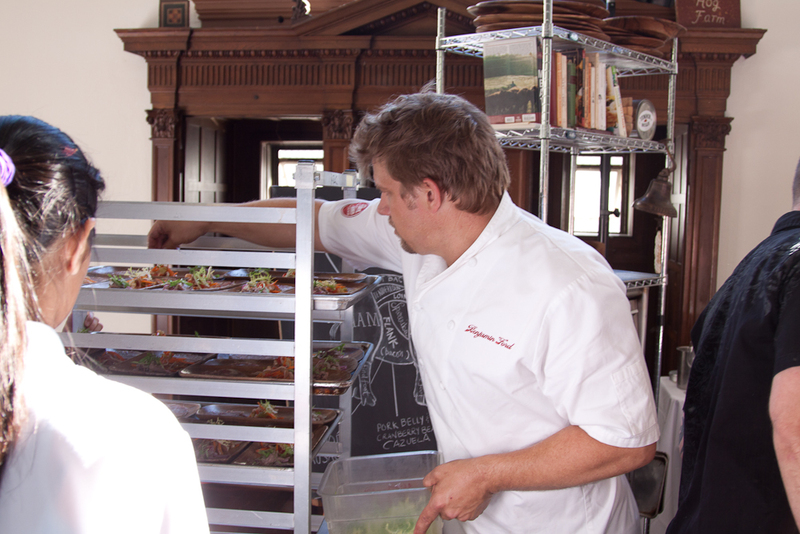 The winner for the Los Angeles stop was Chad Colby from Mozza who prepared an incredible Italian inspired menu. 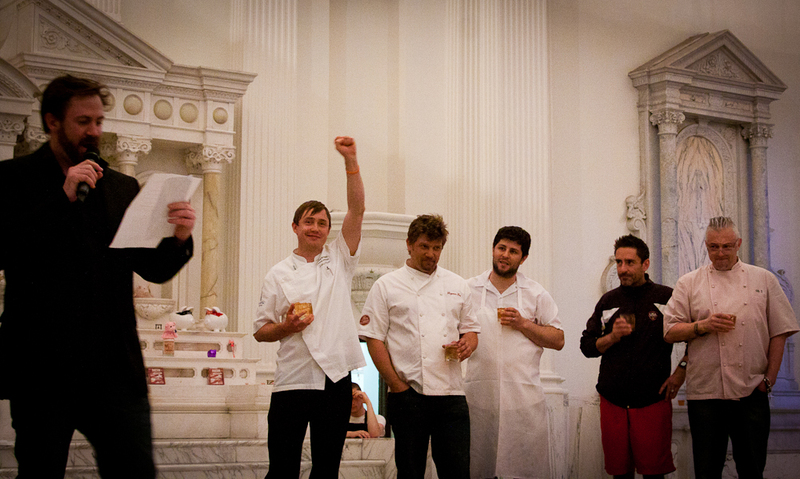 The winner for Los Angeles was Chad Colby from Mozza. 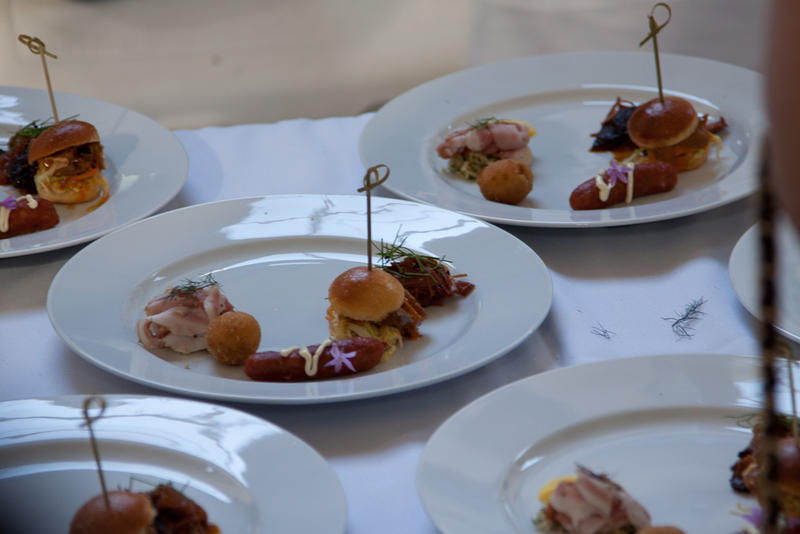 Chef Ben Ford finishing up the judges plates. 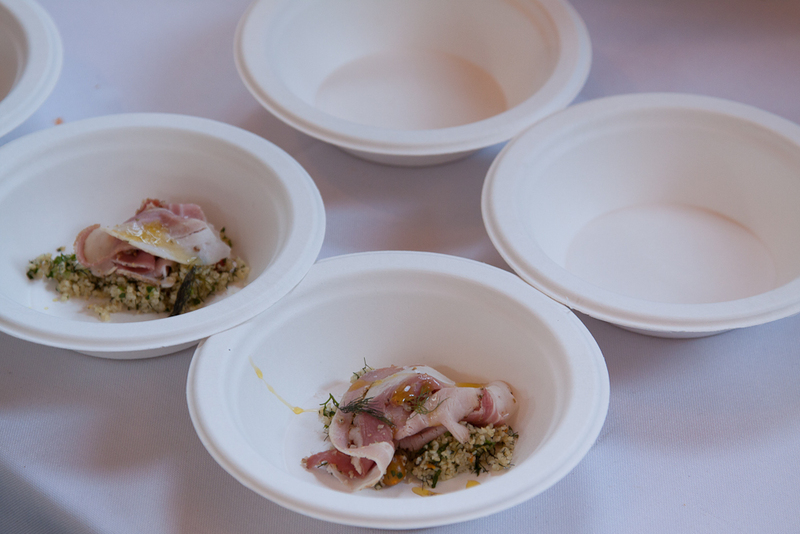 Tim Havidic of – Lindy and Grundy , L.A.
Plates headed to the Judges Table. I revisited this recipe last night because I couldn’t take the picture I originally posted years ago and I had carrots ready to go in the refrigerator. 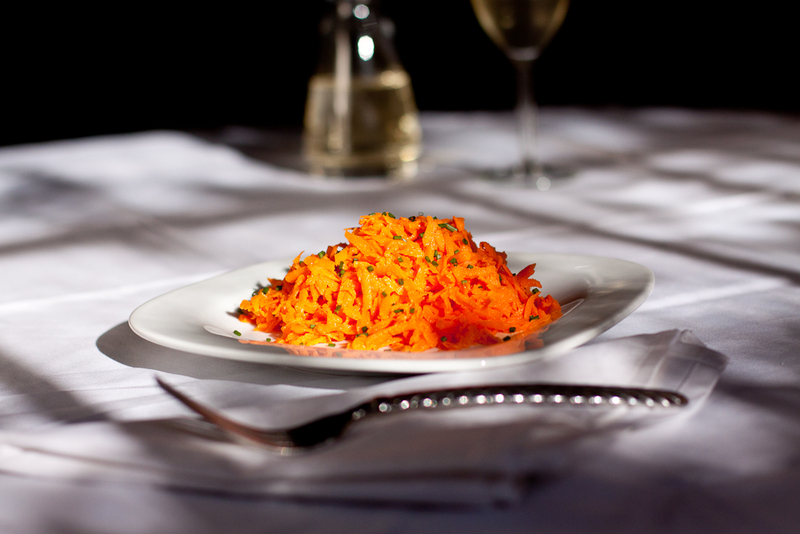 What a great way to use carrots and it’s such an easy recipe to make. You really have all bases covered in this salad. 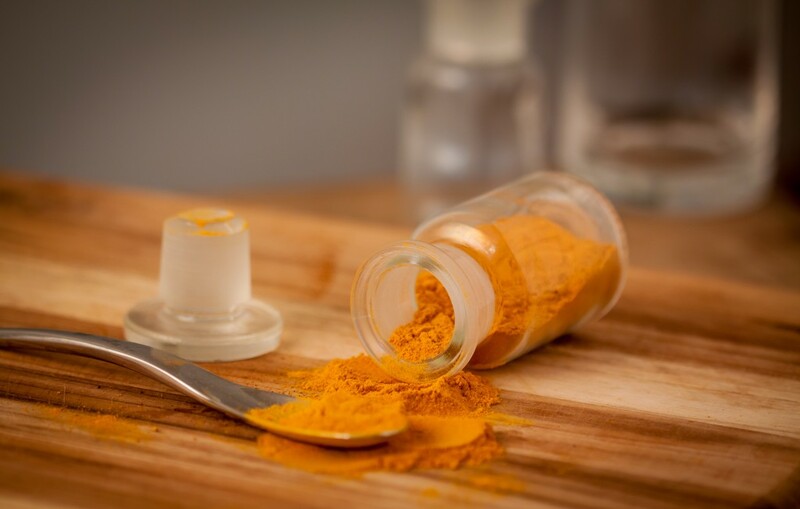 Crunch texture from grated carrots, tanginess from the Dijon mustard, and sweetness from the carrots that accentuated with a bit of honey. Headed to #portland and need recommendations for the best carts and restaurants. Breakfast, Lunch, Dinner and late night snacks.